This post is part of my personal challenge to bake my way through all the challenges of the Great British Bake Off. The challenge below is the showstopper challenge for week three of series two: make a free-form (i.e. hand-shaped, not baked in a tin), flavoured loaf. “I’ve lost my baking mojo,” I said to my boyfriend. So, that skit above is my hello-world! return to proper cooking, baking and food blogging. Since the start of the year I suddenly found it basically impossible to keep up with my commitments, namely juggling work, and my history MA, and seeing friends, and baking. I had to knuckle down to research and write my dissertation and cut out almost all social events with friends. However, I have now submitted and it feels like I am walking into the light from out of a slightly isolated, though book-lined, cave. I was still feeling the after-effects of having handed in the dissertation – slightly exhausted and a bit at a loose end – when my boyfriend reminded me that I should really, really pick up on the baking challenge. The fifth series of the Great British Bake-Off has finished and I am still baking from the second series. I must plough on. The series two bread week signature bake challenge (mouthful!) was to bake a flavoured, free-form yeasted loaf, without using a tin. I decided to go for a bread on the sweet side of the spectrum, something that would be a soft and welcoming breakfast as the days started to close in a little, the morning light becoming murkier and the layers of clothing darkier and heavier – I find savoury breakfasts a little hard to stomach on a workday. Or a weekend. Breakfast is not my friend. The recipe I chose comes, appropriately enough, from Paul Hollywood himself. 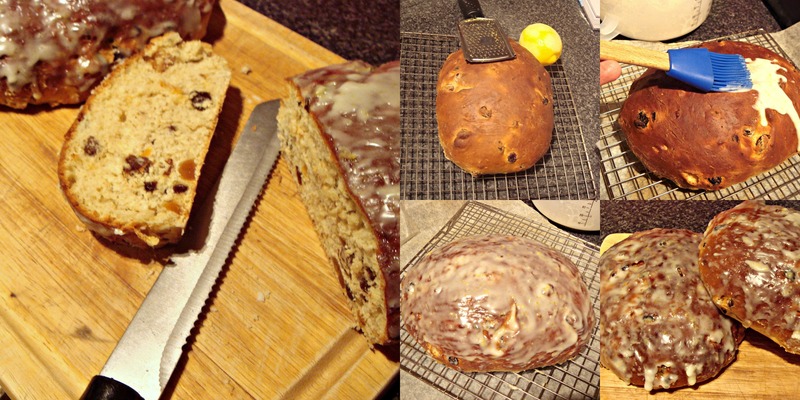 As much as ‘the male judge’ (as he became known on the fifth series, after a contestant – the eventual winner – momentarily forgot his name) sometimes grates on camera, I have to admit his Fruit Loaf (or rather loaves, for the recipe makes two) was delicious. Don’t let the name put you off if you don’t like dark, heavy fruitcakes or mincemeat; I don’t either. This is a light, fluffy-textured loaf rather than one so dense with dried fruit that it resembles a doorstop. The lemon zest in the soft, deliciously drippy icing also lifts the flavour. I did substitute the called-for chopped mixed peel with a few extra raisins, because I really don’t like candied peel very much, even if I make it myself. I think the combination of spices, raisins and mixed peel gives a very characteristic, slightly stodgy, ‘English’ flavour to a lot of sweet, baked goods; for me, taking out the mixed peel retained that distinct English taste without the slightly bitter edge which I find so off-putting in a mince pie. Place the flour into a large mixing bowl. Add the salt to one side of the bowl and the yeast to the other, so they do not touch. Add the butter, sugar, eggs, milk and half the water. Take a mixer fitted with a dough hook and mix on low speed. As the dough begins to come together, slowly add the remaining water – be careful as you may not need all of it. Continue to mix at medium speed for five minutes until the dough is elastic and soft to the touch; it should have a bit of spring to it, so if it looks unmixed or breaks easily if you pull gently at it, mix for a further two minutes. When done with mixing, add all of the dried fruits and cinnamon and mix again for two minutes. Cover the bowl with a damp tea towel or loose clingfilm and leave the dough to rise until at least doubled in size – at least one hour, but it’s fine to leave for two to three hours. Tip the dough onto a clean, lightly floured surface. Fold it inwards repeatedly until all the air is knocked out and the dough is smooth. I did this by taking the ‘corners’ and tucking them in to the centre until seamless. Divide the dough into two pieces (I weighed this for maximum uniformity). Shape each piece into a ball (again, I did this by tucking the ‘corners’ into the centre until a ball was formed and then smoothing the join). Place each ball onto a prepared bakin tray. Loosely cover each tray with clingfilm and leave to prove for an hour or until the dough is doubled in size and springs back quickly if pressed lightly with your finger. Preheat the oven to 210C in the meantime. For the icing, place the icing sugar and lemon zest in a small bowl and slowly whisk in the water, half a teaspoon at a time, until the mixture has the consistency of a thinnish batter but is still thick enough to drip, rather than run freely, off a spoon. Brush this mixture over the top of each warm loaf and leave to cool. The icing will set a little but won’t go hard and will get a bit sticky over time. (The baking paper under the wire rack will catch the drips from the icing, making it easier to clear up). Nibble on for breakfast, tea and throughout the day with butter.